pumpkin | "blackberry-eating in late September"
As I noted a few weeks ago, all I want to do in my kitchen, still searingly bright with sunlight from Southern California’s misguided attempts at “fall,” is bake. Luckily, one of the few cool weekend days we’ve had since then corresponded with a break in grading, and I had a chance to see if my dough skills are still in there somewhere. Inspiration for these pretty, autumnal loaves came from a seasonal box of those lovely raincoat crisp crackers Trader Joe’s puts out, these a bright, turmeric-esque orange from pumpkin and flavored with dried cranberries and sunflower seeds. I decided to see if I could translate them into a bread. The ingredient list on the box of crackers served as my starting point, but for quantities I returned to these loaves from last year, replacing the rye flour with whole wheat, dolling them up with the dried cranberries, a few additional seeds, and some fresh herbs, and running some of the seeds through the dough itself rather than reserving them all for the top. As before, though, the secret is cooking down the pumpkin puree first to dry it out. It adds a little time to the whole endeavor, but makes the dough much more manageable and more aggressive in pumpkin flavor. 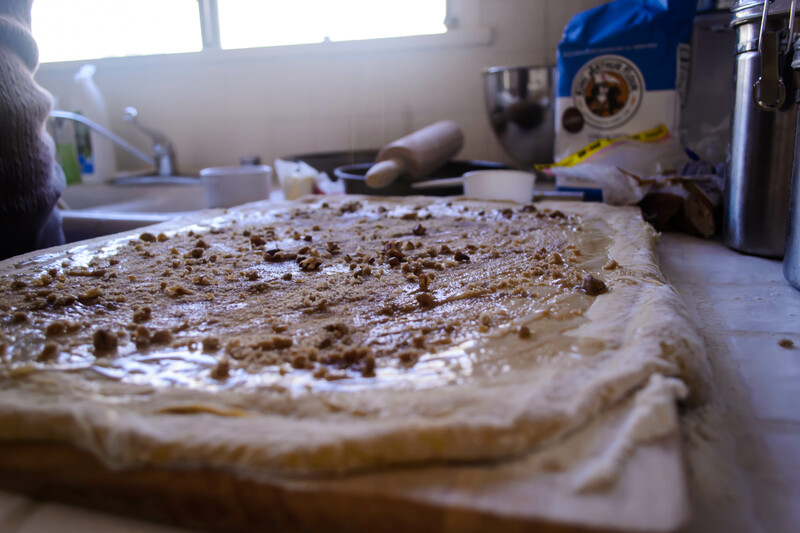 The dough here is soft and elastic and slightly sticky, even after its first rise, and the hardest part of the process is convincing yourself not to use too much flour on your board when you shape them, because the dustier with flour they are, the harder it will be to get seeds to adhere to their surface. Internet forums abound with how to get seeds to stick to the outside of a shaped dough-ball; the easiest and most effective method seems to be dampening the surface of the dough slightly by spraying or brushing with water, then gently pressing it into the mixture of seeds and, in this case, oats. It doesn’t guarantee they won’t tumble off while you’re carving thick slices, but at that point, you at least have the option of spreading the slice generously with cream cheese* and sprinkling the rebels back on, where they are sure to adhere. As for flavor, these delightfully toe the line between sweet and savory. Pumpkin is so commonly paired with sweet flavors, and the dried cranberries and nutmeg seem to push it in that direction, but the woodsy herb flavor (the crackers use rosemary, which I think I’d prefer, but in the moment I only had sage) and the nudge of heat from the black pepper keep it from feeling dessert-like. I’m not sure you would want to use this for sandwiches, but I could imagine it being a starchy side for a roast chicken or a big dinner salad. I find, though, as with many freshly baked loaves, I want it most in mid-afternoon, when it is still just warm from the oven, and I am slightly peckish and starting to dream about dinner. *goat cheese is nice too, and though I suppose you could make it into frozen slices a la this peanut butter “hack” the internet responded to with hilarity a few weeks ago to prevent tearing your bread, you could also just let the goat cheese come to room temperature, at which point it smears pretty easily across the tender slice. In a small skillet, cook the pumpkin puree over high or medium-high heat for about 15 minutes, stirring frequently, until the color has deepened and the puree has dried and has a texture something like a thick frosting. Set aside to cool. While the pumpkin comes to room temperature, add the pinch of sugar to the warm milk, then stir in the yeast and let it sit to burble for 5-10 minutes, until it is bubbly and smells like bread. Pour the yeast and milk mixture into the bowl of a stand mixer fitted with the paddle attachment. Add 1 cup of the oats, all of the whole wheat flour, the molasses, the melted butter, and the cooled pumpkin. Stir with the paddle attachment to combine. 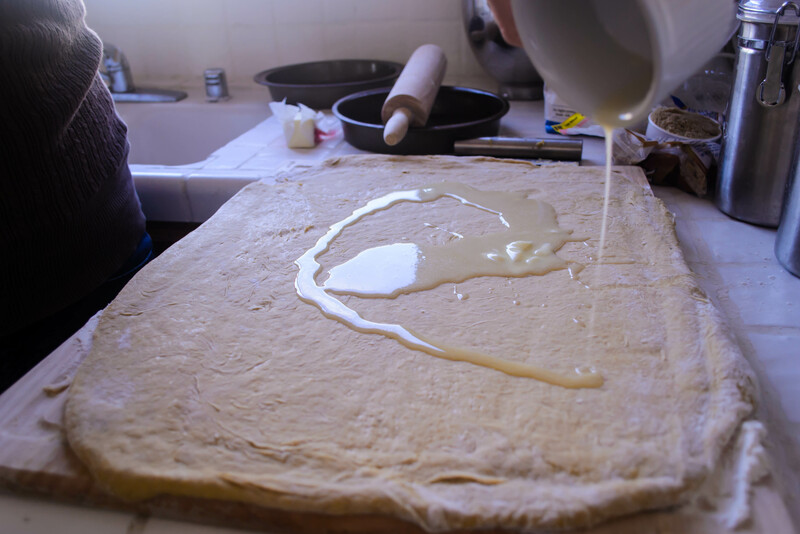 Now add 1½ cups of the bread ½ cup at a time, paddling in between, until a soft, sticky dough is formed. Dump in the rosemary or sage, the nutmeg, the pepper, the salt, the dried cranberries, ½ cup of the sunflower seeds, and all of the ¼ cup flax seeds, and paddle again just until integrated. Switch to the dough hook and knead at medium speed until it comes together into an elastic but slightly sticky dough, 8-10 minutes. If it doesn’t seem to be coming together, continue adding the bread flour ½ cup at a time as needed, kneading a minute or two in between each addition. You may not need all of the bread flour. Cover the bowl of kneaded dough with plastic wrap and set aside in a warm spot to rise until it has doubled, 60-90 minutes. While this is happening, combine the remaining ¼ cup rolled oats, ¼ cup sunflower seeds, and the ½ cup pumpkin seeds in a large, shallow bowl. After it has risen, punch down the dough by gently depressing your fist into the center of it. Pour and scoop it out of the bowl onto a lightly floured board and divide in half using a dough scraper. One at a time, shape each half into a round by holding the dough ball in your hands and stretching the top taut, tucking the excess underneath. Each time you stretch and tuck, turn the dough a quarter turn or so. You can also do this while the dough is resting on your board, turning it and tucking the excess, which will form something that looks like a balloon tie or a belly button underneath. Check out this series of photos from the kitchn for helpful illustrations. When you have a round loaf that is reasonably taut across its domed top, spray or lightly brush it with water, then gently press all sides of it into the mixture of oats and seeds you’ve prepared. Repeat with the other half of the dough. Gently place the seeded loaves on a baking tray lined with parchment paper, lightly cover them with plastic wrap or a clean kitchen towel, and set them aside to rise again for about 45 minutes. Meanwhile, preheat the oven to 375F. After 45 minutes, with the loaves swollen, place them carefully in the oven and bake at 375F for 35-45 minutes, until they reach an internal temperature of 180-200F. I’ve felt pressed since summer, when it comes to posting – I’ve been, all too often, a negligent blogger. There are many reasons for this, especially in the past few weeks, but I realized part of the reason lately, and that reason is the absence of a group. I liked the challenge of a monthly bread assignment, and between the dissolution of the Twelve Loaves baking party, heat, and busyness, I haven’t been doing as much experimental bread baking as I used to. I looked back, for another cooking project a week or two ago, at the notes I’d made about Suzanne’s site in my Five Seed Loaves post, and was reminded of the idea for a bread – inspired by hers – that incorporated rye flour, and canned pumpkin, and maybe some rolled oats for heft. With a long weekend looming and the season of pumpkin upon us, it seemed like the right thing to do. The problem with canned pumpkin, as anyone knows who has grown frustrated by repeated testing of that pumpkin chocolate chip bread that just will not finish baking, is its incredible water content. It keeps baked goods amazingly moist, but it also is a sopping, wet, hard-to-deal-with mess if you aren’t careful, especially in dough. Irvin helped me solve this problem, with the ingenious tip he discovered of cooking down your canned pumpkin first, to eliminate some of that pesky moisture and concentrate the flavor. 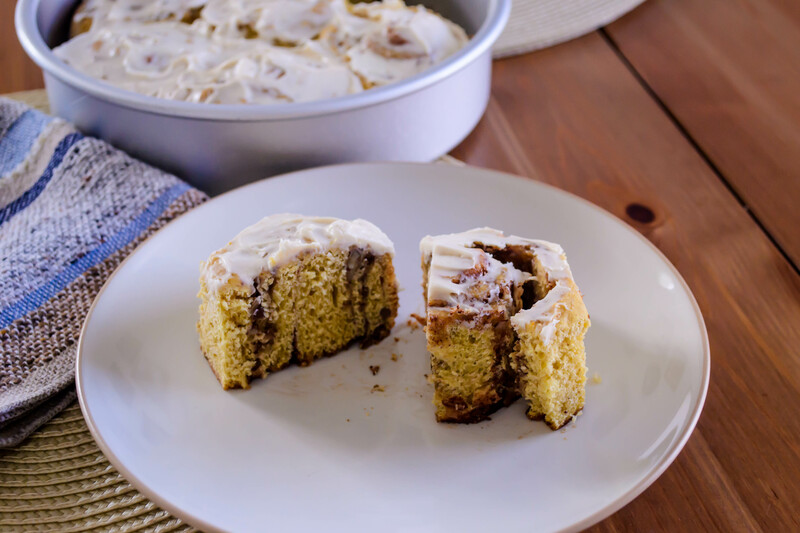 A quick, hot fifteen minutes of near-constant stirring and folding results in a thick, deeply sunset orange pan of something the texture of thick frosting that adds flavor and richness, but won’t bog down your mixture. I foresee many pumpkin-centric baking projects in the future, now that I know this helpful little extra step. As with most breads, this one involves a substantial knead, a long first rise, a punch and a shape and – after a roll in some pumpkin seeds and rolled oats for texture and indication of predominant ingredients – a second rise before baking for a little over half an hour. These loaves incorporate some molasses for sweetness and color, and milk rather than water. I must admit, the rye flavor doesn’t come through overly much here, though I suspect it added to the substance and of course to the lovely toasty color of the finished loaf. The pumpkin is mild as well, but you can taste it despite the absence of the telltale wintry spices that usually accompany this big squash. It’s satisfyingly orange inside (which makes photo editing tricky, by the way! ), and it is a rich autumnal flavor I already want to taste again. The oats all but disappear into the dough as it bakes, and they contribute to the pleasant, spongy density of the thick slices you’ll be carving off to slather with cream cheese. 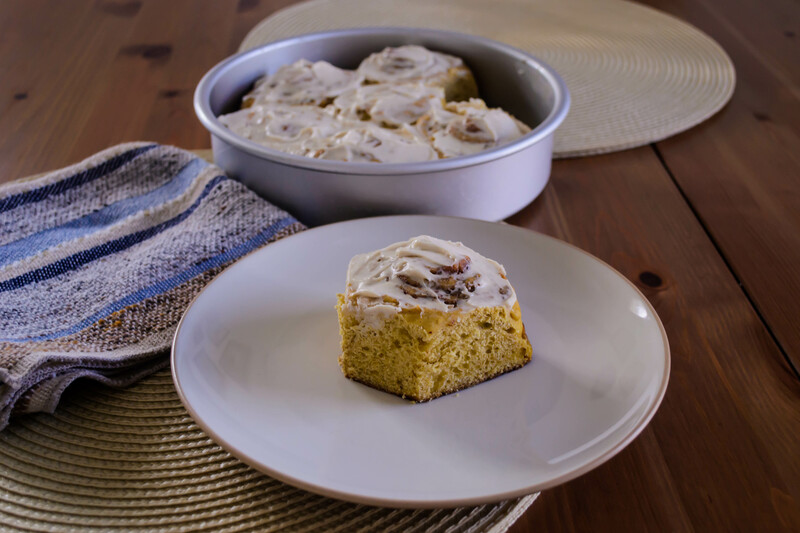 Cooked the canned pumpkin in a skillet over high heat for 10-15 minutes, stirring frequently to avoid burning, until it is thick and reduced and takes on the consistency of a thick, spreadable frosting. You should wind up with only about ¾ cup left. Let it cool to room temperature. While the pumpkin cools, combine the warm milk with the yeast and sugar, stirring briskly, then let sit for about 10 minutes to allow the yeast to activate. The surface of the milk will get bubbly and smell bread-y. 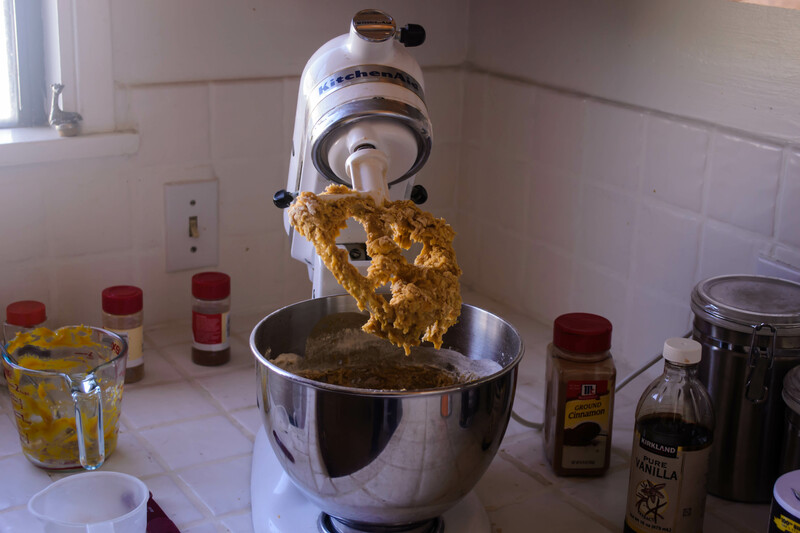 In the bowl of a stand mixer, combine the yeasted milk, 1 cup of the oats, the rye flour, the molasses, the melted butter, the salt, and the cooled pumpkin. Use the paddle attachment on low to medium speed to combine. Now begin adding the bread flour ½ cup at a time, paddling in each addition, until a soft dough forms that pulls and tears away from the side of the bowl. You may not need the entire 3 cups of flour – I ended up using about 2½ cups total. Switch to the dough hook and knead on medium speed for about 5 minutes. The resulting dough will be soft and sticky – a play-dough that clings to your fingers – but that’s okay. The oats need time to absorb the liquid so it will become less tacky as it rises. Spray the inside of the bowl with a non-stick spray or olive oil, flipping over the dough so both sides are coated. Cover the bowl with plastic wrap and set it in a warm place to rise until doubled; 60-90 minutes. When the dough has doubled, punch it down by depressing your fist gently into the middle, then let it sit to get its breath back for about 10 minutes. While it rests, spray two 9×5 inch loaf pans with non-stick spray and start the oven preheating at 375F. Combine the pumpkin seeds with the remaining ½ cup of oats and spread out on a flat, rimmed surface like a cookie sheet. 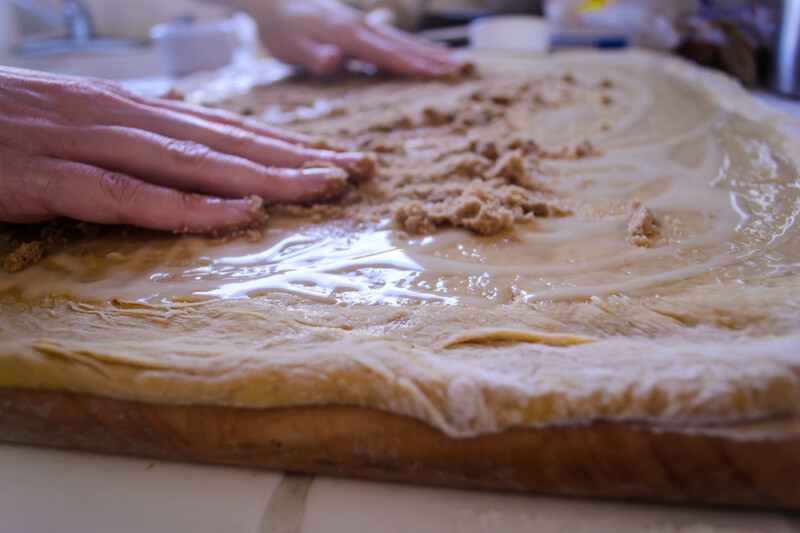 Carefully dump the risen dough out onto a very lightly floured board. The more flour you use, the more trouble you’ll have getting the seeds and oats to stick. Divide the dough into two equal hunks, then form each into a loaf and roll it through the seed and oat mixture before settling it into its respective loaf pan. If you have a lot of trouble getting the oats and seeds to stick, spray the loaf with nonstick spray or olive oil first, then have another go. Cover the loaf pans with plastic wrap and set the loaves aside to rise again for about 45 minutes. When the loaves have just about doubled in size again, remove the plastic wrap covering them and carefully set them into your preheated oven to bake until their central temperature reaches 180-200F; about 35 minutes. Let the loaves cool in their pans about 10 minutes, then remove to a wire rack to cool completely. The time of peace is coming. I can feel it. I need it. This is week 14 of a 16 week semester, and though I had a brief respite from grading this weekend, this week papers begin pouring in again. And this is not to say that my weekend wasn’t busy. It was crammed, jammed, packed, precariously scheduled. It was just busy with other things. But I felt, for just a moment, the peace I’m craving. I caught myself, about five minutes into dusting the living room, enjoying it. I’ll wait while that sinks in. Before you think me a complete freak, let me say this is a highly irregular occurrence. I don’t enjoy dusting. In fact, within ten minutes of noticing this odd feeling of pleasure, I was tired of the activity again. But for those few minutes, there was something so calming, so reassuring, so soft and easy about running a cloth over the bookshelves and the side table and the TV stand. It was a moment that was easy to escape from. It was mentally effortless. I thought, “I need this.” I need this peace, this feeling of being brainless with no guilt. Fortunately, this time is approaching like a freight train (it would be nicer if it were approaching like fog, or frosting, or some other delicate F word, but we must be honest…). The commercials I try not to pay attention to when I watch television loudly broadcast how many shopping days are left until Christmas. Within my family, texts about gifts have started flying. I may or may not already know exactly what I’m wearing for my family’s Christmas dinner. But that’s getting ahead of things. That’s the full stop. We do get a funny little moment of pause first, which is what the dusting was for. My parents arrive on Wednesday to celebrate Thanksgiving. It will be the first year my sister doesn’t join us. This is, when I think about it, a stab of selfish sadness. But that only lasts a moment, because instead of winging her way all the way across the country to be with us for one short weekend, she’ll be with her partner and her dog, with his family. This is a joyful thing. She sent me a photo of a batch of pumpkin bread cake pops she made to take along. She said something about “impressing purposes.” She won’t need cake pops to do that. It does seem like pumpkin is the thing to do these days. I was unsurprised that this month’s Twelve Loaves project calls for that most celebrated of squashes. I typically try to imagine something no one else will have made for the Twelve Loaves challenge, but this month I decided to loosen up. The fact was, I wanted pumpkin sweet rolls. So no matter how many other people chose this too (two so far), I was making them. Originality be damned. Sometimes you just have to make what you’re craving. For these rolls, I started with my Nana’s sweet roll dough, but used all whole milk instead of water for added richness. 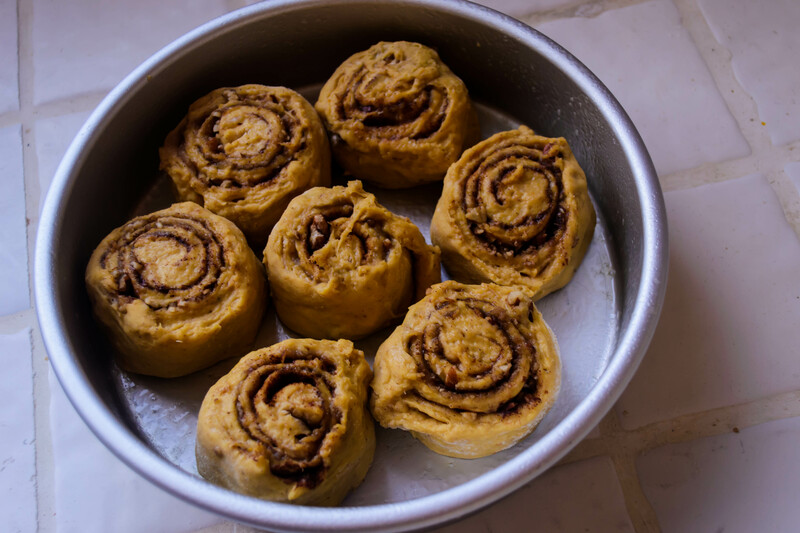 I replaced the white sugar with brown, to play with the autumnal feel of the pumpkin, and spiked the dough with all the spices that usually find their way into pumpkin pie. And then, of course, the bright orange vegetal sweetness of pumpkin puree. 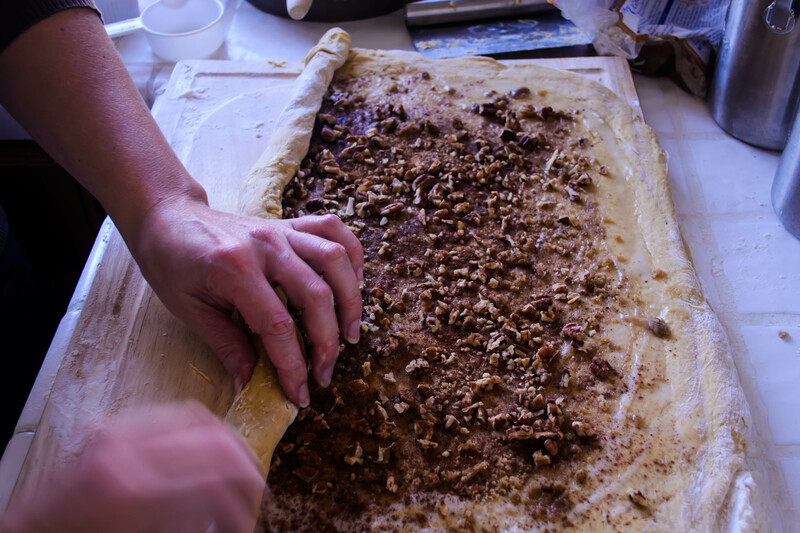 Once risen and rolled out, I spread it with melted butter, more brown sugar and cinnamon, and a scattering of toasted, chopped pecans. Rolled, sliced, and baked, they puffed into glorious swirls – orange gold, with dark bronze bubbling fissures twisting through them. Pulled apart just like that, they were delicious. Because I didn’t overdo it on the sugary center, they could almost pass as breakfast. But this is holiday food, and holiday food is so often about excess that I couldn’t help myself. A quick whip of cream cheese with a breath of powdered sugar, a splash of vanilla, and just a touch of heavy cream to loosen it up, and I had a soft, thick frosting to spread over their golden tops. I left two pans in the department mailroom at work. By the time I left in mid-afternoon, there weren’t even crumbs left. Making these rolls is an investment. They have a long ingredient list. The dough can be quite sticky. They require two rises. They demand rolling, chopping, toasting, sprinkling, whipping, spreading… but they also require pulling into shreds of sweet chewy dough, and assiduous finger licking. And meditative savoring. And here’s the thing: the holiday season often feels hectic. There is shopping to be done, and traveling to navigate, and wrapping and cooking and impressing family you rarely see, and all of that can feel like too much to squeeze in a complicated baking project. 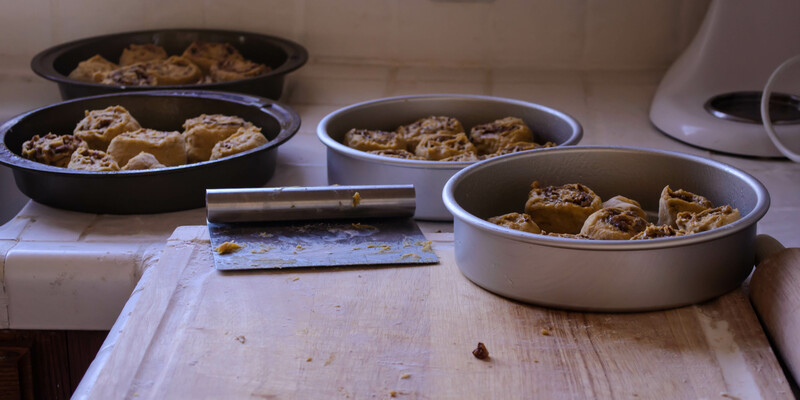 But I think, if you embark on such a baking project, knowing the time it requires, and sinking into its gentle rising and baking schedule, it provides its own kind of peace. Besides, these are too good not to make. So just make some. Thanksgiving breakfast, maybe. You’ll thank me later. 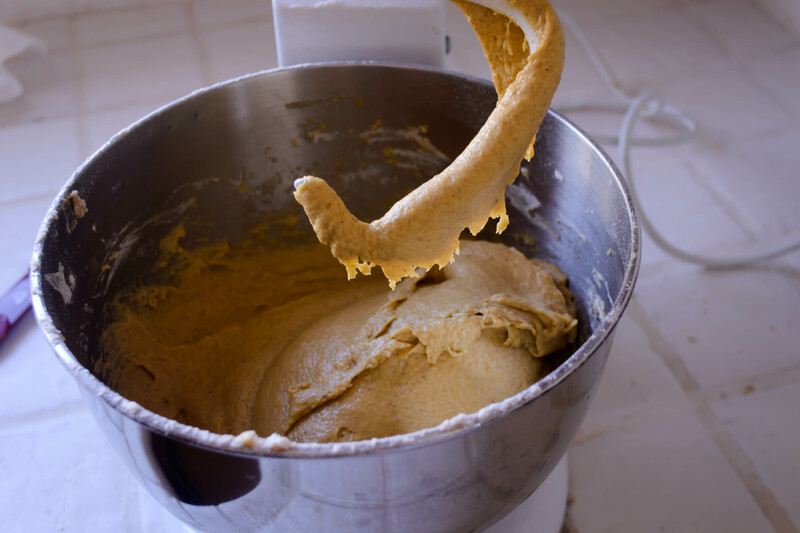 In the bowl of a stand mixer, combine yeast, lukewarm milk, and the pinch of brown sugar. Stir, then let sit for 5-10 minutes until the yeast is bubbling and smells like fresh bread. Once the yeast has woken up, add the rest of the sugar, the salt, the eggs, the butter, the pumpkin puree, and the vanilla. Mix on medium-low speed with the paddle attachment to combine. Add 4 cups of the flour and all of the spices, and mix on medium-low again to combine. You will have something like orange cake batter. Add 2 additional cups of flour (this is 6 total) and mix to combine. Switch from the paddle attachment to the dough hook and knead for about 5 minutes, or until a sticky but slightly elastic dough has formed. It will not become a firm ball, but will pull away from the sides of the bowl in stretchy threads. 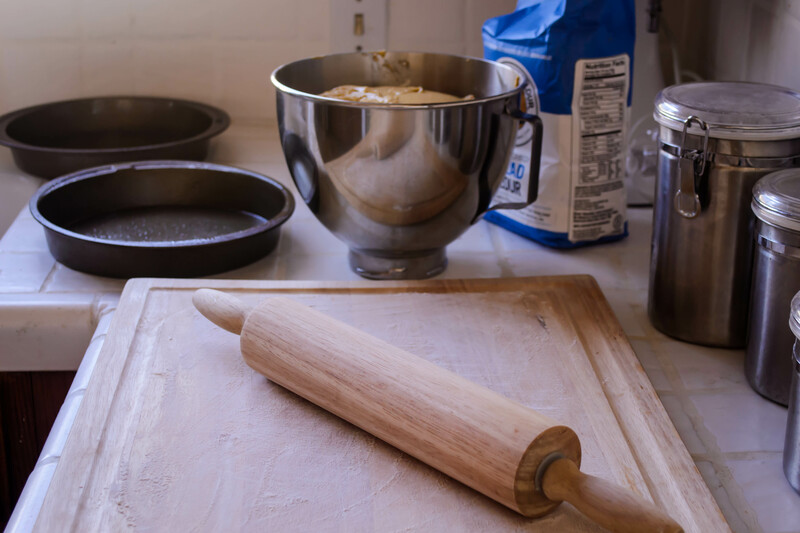 If the dough is not pulling away from the sides of the bowl at all after the first three minutes, begin adding the remaining cup of flour ¼ cup at a time, kneading well in between each addition. When the dough is kneaded, spray the sides of the bowl with a non-stick spray, roll the dough over in it once or twice to coat, then cover the bowl tightly with plastic wrap and set it aside to rise until doubled – about 90 minutes. 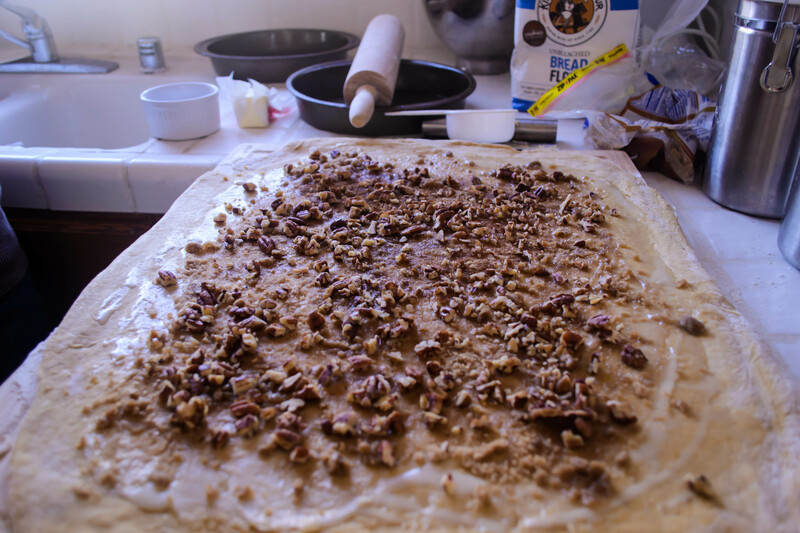 While the dough rises, prepare the filling ingredients – toast and chop the pecans, melt the butter, and get the cinnamon and brown sugar measured out for easy application. While you’re at it, spray pans with non-stick spray. I used two 9-inch and two 8-inch cake pans. Square or rectangular pans would work fine as well. 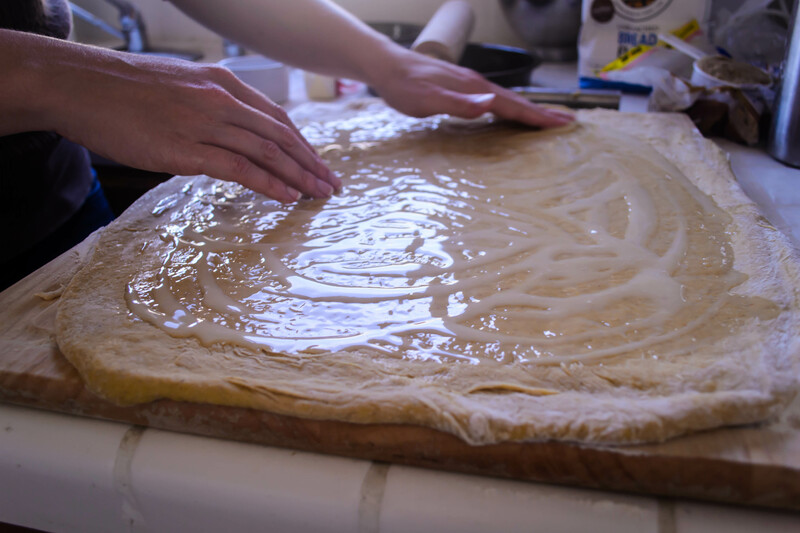 Dump the risen dough onto a well floured board. If it is aggressively sticky, dust the top of the dough with flour as well and knead by hand a few times, until it is easier to work with. With a dough scraper, a pizza cutter, or a sharp knife, cut the dough in half and stow one half back in the bowl. We will work with one half at a time. 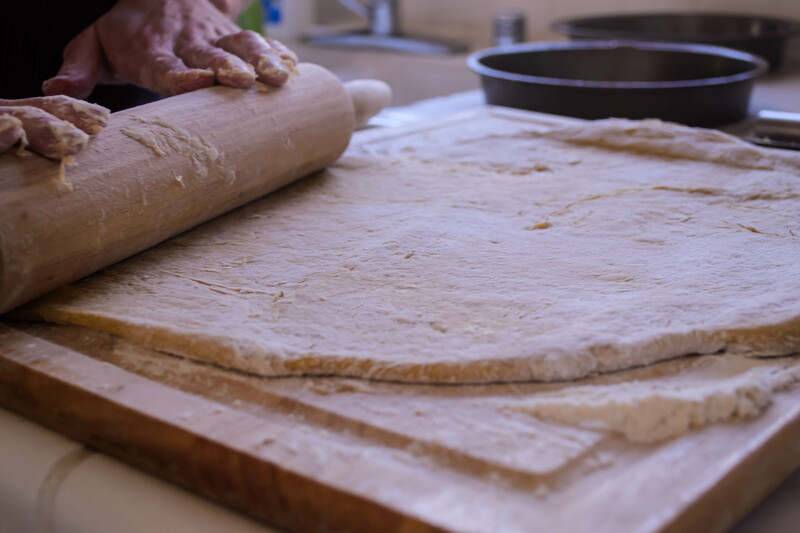 Using a well floured rolling pin, roll the first half of dough into a thin rectangle (about ¼ inch thick, if you can manage it). The size of this rectangle will depend on how much your dough has risen. Aim for thickness rather than dimensions. 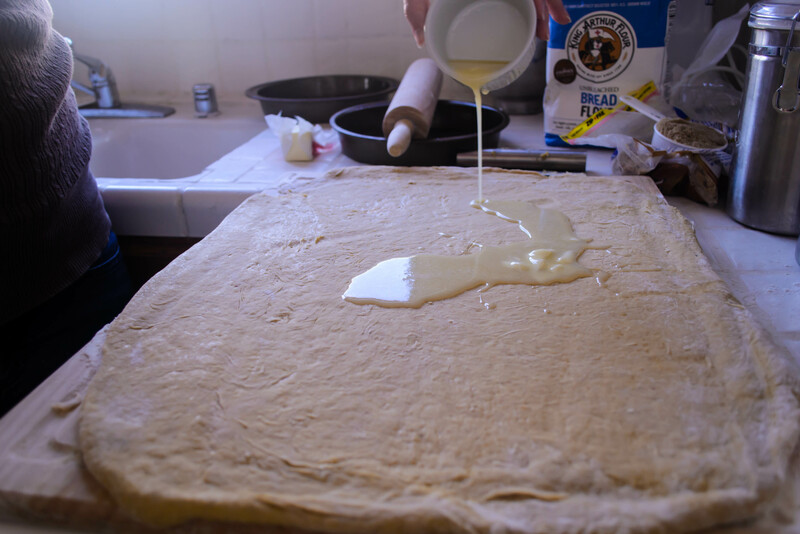 Pour half of the butter over your dough and spread it across the surface with your fingers. Leave a border of about ½ inch on all sides. Sprinkle half of the brown sugar and half of the cinnamon over the surface, again respecting the border. Spread for even coverage if needed. Sprinkle half the pecans over the buttered, sugared surface. Now, we roll. 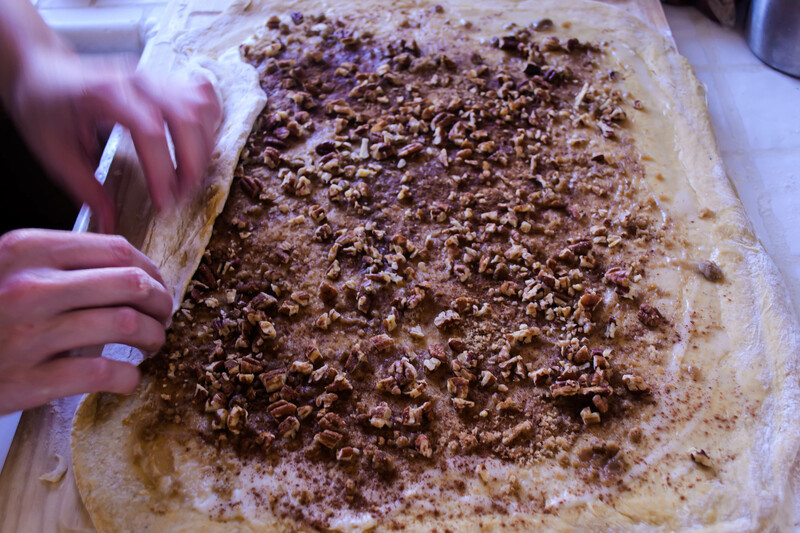 Beginning in the middle of the long edge of your dough rectangle, begin to roll up the dough into a long log. Once you have rolled a revolution or two in the center, move your hands toward the edges, rolling them up as well to create an even log. 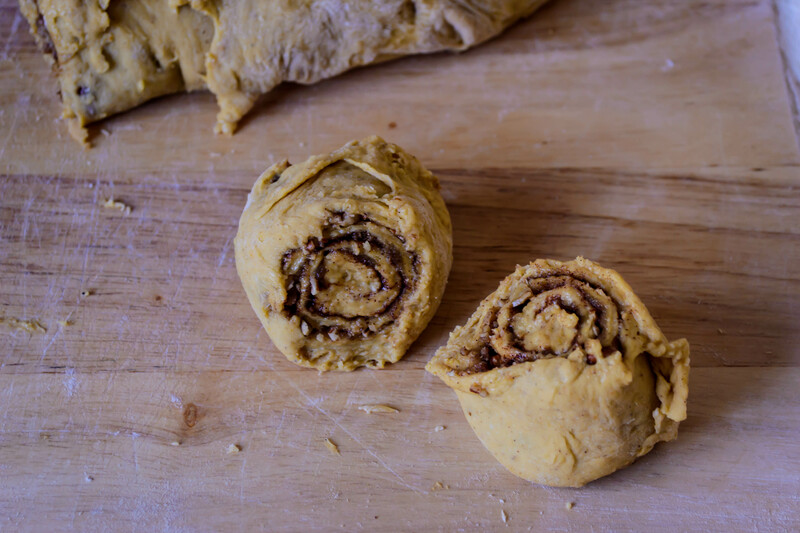 As you reach the end, pull the loose edge of dough firmly against the log you have made and pinch and crimp it into the already rolled dough to create a seal. Using a serrated knife, cut your log into slices 1 to 1-½ inch thick. To do this without squashing the rolls, use almost no pressure as you saw the knife back and forth. Settle the slices with the filling swirl exposed in your prepared pans, and repeat the process with the remaining half of the dough. When all of your rolls are, well, rolled, drape the pans with clean kitchen towels or plastic wrap and let them rise again for 45 minutes. During the last 30 minutes of this second rise, preheat the oven to 350F. After their second rise, the rolls should have noticeably puffed and be pressing against each other. Remove the towels or plastic wrap and stow the pans in the oven for 20-22 minutes, until the rolls are nicely browned and the filling inside is beginning to bubble. 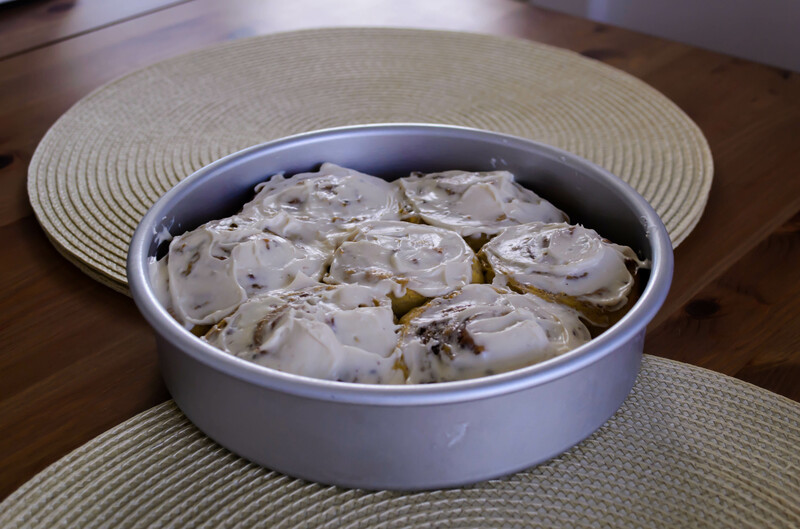 Remove and set aside to cool while you make the frosting. In a medium bowl (or, if you’ve been proactive enough to wash your stand mixer bowl, use that), whip the cream cheese until very smooth with a whisk or electric mixers. Add the vanilla, the powdered sugar, and 3 tablespoons of the cream, and mix to combine. You are looking for a texture a touch thicker than condensed milk – too thick to pour, but loose enough to wilt toward the edges of your icing spatula. If it seems too thick, add the final tablespoon of cream and mix again. 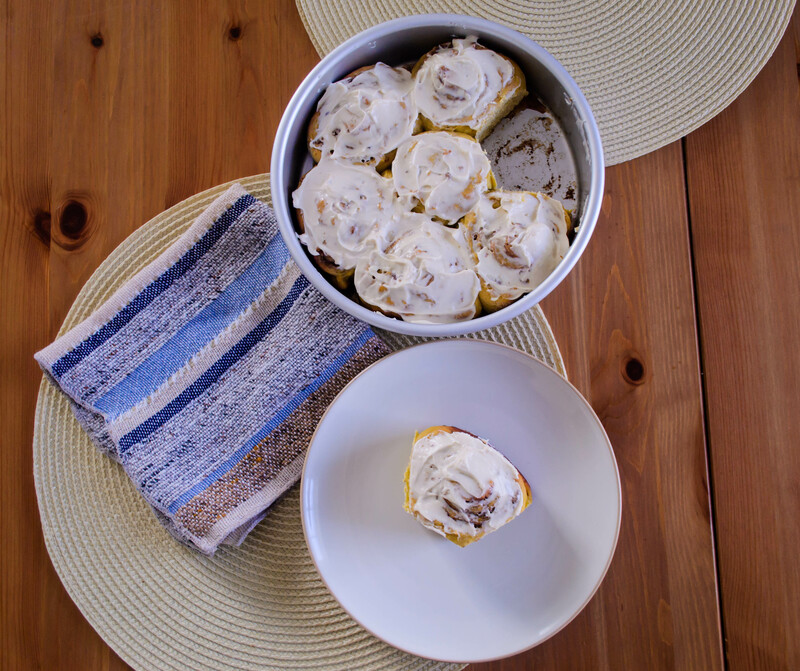 While the rolls are still warm, spread with the frosting. This makes enough for about one tablespoon per roll. I found individual dollops, then careful spreading over one roll at a time, made for a more attractive result than just globbing on a pile and spreading over all of the rolls at once. 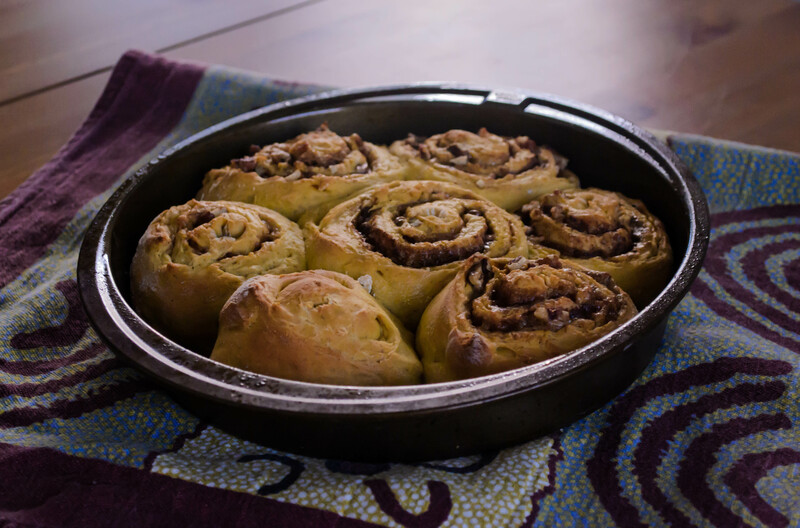 Separate rolls using a butter knife or an icing spatula and serve warm (they are fine at room temperature too, but if you refrigerate the leftovers, I recommend warming them up before eating, as the dough gets a little dry when cold).